Hello! This is Jeremy, calling with an update after our Cayambe climb today. We've just finished a delicious lunch at Hacienda Guachala, and team members are now enjoying some much-deserved rest. After an early bedtime, we awoke at 11pm on Wednesday night to prepare for our climb. We could tell, right away, that it was going to be an interesting day as we felt the hut shaking from the wind! We left the Cayambe Refuge a little after midnight and started moving up the mountain at a moderate pace. Everyone was feeling good, and we made steady progress. Although windy, we had clear skies above and enjoyed hiking under the stars. As we continued our climb, we noticed lightening flashes on the clouds on the far (eastern) side of the mountain above the Amazon Basin. We didn’t see any lightening bolts and proceeded up and across the lower glacier. The higher we climbed, the more we experienced increasing wind, clouds, and eventually snow. Despite the challenging conditions, team members wanted to push on as far as possible. I have to say, this is quite an impressive group of very determined people! 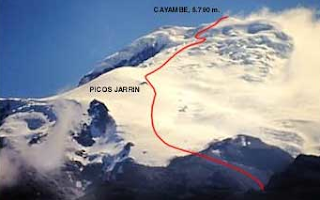 At 4:30am we reached Picos Jarrin (17,100 ft / 5212 m), a rocky outcrop on Cayambe’s western face. The group was happy to have reached that point, and with wind and snow increasing, we all agreed it was a great place to call our high point and head back down. Everyone felt good about how hard they had worked, and I know each person was very glad to have made it to Picos Jarrin. As we began our descent, the snow continued and followed us all the way down to the refugio, and as the wind picked up, we knew we had made a smart decision. We made good time on the descent and got back to the hut a few minutes before 6:00 am. We napped for a couple of hours, ate breakfast at 8:00, and left by 9:00 for Hacienda Guachala. Everyone is pretty tired (no surprise!) but feeling good. As I mentioned, we had a great lunch, and now we’re going to have an easy afternoon at the hacienda or take walks through the beautiful landscape that surrounds us here. Though we ate a short time ago, I heard a couple of people already talking about what they’re thinking of having for diner. Yes, we burned some serious calories today! We'll try to call again tomorrow after our drive into the Antisana Nature Reserve.